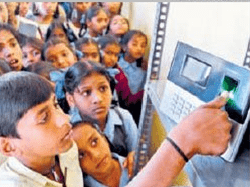 Automatic School Students attendance Machine can be used using the face recognition technology. Fingerprint is not the correct solution for the kids as there prints changes very frequently and marking the attendance become a problem. A lot of time is wasted daily of teachers and learners in marking attendance. A lots of efforts are made to automate this process. RFID cards can be used to mark the attendance but there are chances of marking proxy by card being carried by the fellow students. There are good number of chances that students may forgot there cards at home. Moreover they need to touch the cards near the machine to mark the attendance. Attendance will not be marked in case student forgot the card at home. To overcome the above mentioned issued UHF cards based time and attendance machines are used. These receivers are capable of capturing attendance from a distance range of 15 to 20 meters. So the automatic attendance will be marked as soon as the student enters the school premises. There can be multiple reads which can be attached to the controller to identify the UHF cards which are carried by the students. 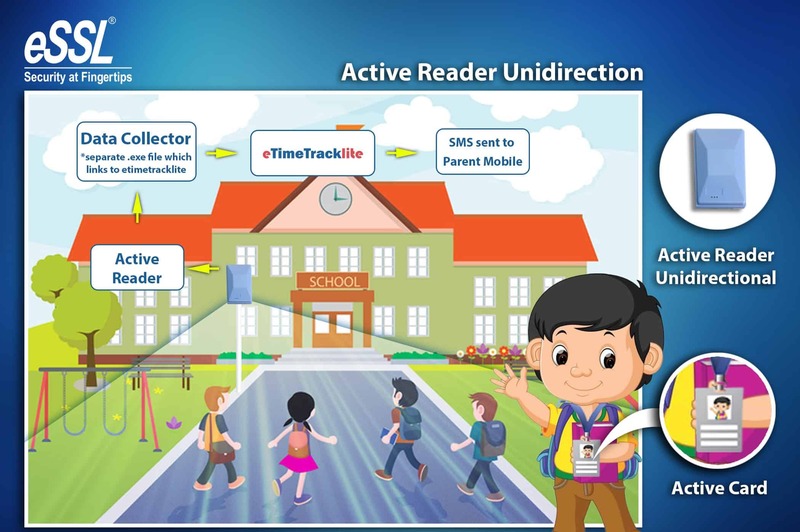 The assumption in these kinds of readers are that no 2 students will be at same distance from the reader. 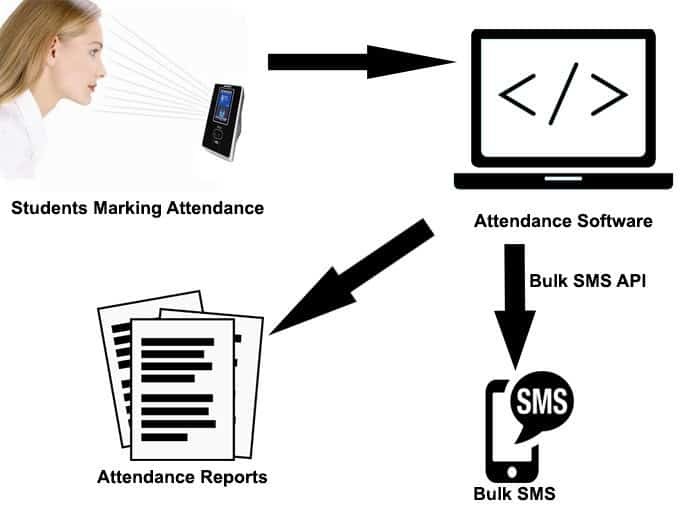 This can further be integrated with time and attendance software to generate reports which can be used by school or parents. Bulk SMS system can be integrated with the software using the Bulk SMS API. This will be used to send SMS to the parents about the arrival time of the students and absent report in case a student doesn’t arrive at the given mentioned time. UHF readers solved one problem but is still left with the problem of proxy. The best available solution to this problem is to use Face recognition technology. Face of the students can be registered to mark the attendance of the students. Automatic School Students attendance Machine can be used. Students can come in front of the machine in the morning and mark the attendance. Various attendance machines can be installed according to the height of the students. Suggested quantity is to install one machine per classroom per section but one can install one machine for every class. The quality decision needs to be taken depending upon the queuing time of the students. To get this solution for your school please feel free to contact us at 09818390836, 09315441078 WhatsApp 9315441053 or write an email at info at ampletrails.com or fill the following form. School Management Software is required by school for managing the information of students. School Management Software plays a very important role in managing the students data. These types of software are also refereed as school erp software. School Administration Software are required for the better administration of school students data. Manage Student Records, Fees Management, Accounts, Library Management System, SMS. We have Best School Management Software for managing students information. School Management Software or School Software or School ERP are different terms used for school software. Get the best school management software for your school. We are the best school software company in India. Our desktop based application help schools in managing students information. Get all your records computerized. Our School Management Software is designed for managing pre schools, primary school, high school, higher secondary schools, state, cbse, icse, igcse schools. We also build websites for CBSC schools according to CBSC norms. Our School Management Software helps to automate all the functions of a school ensuring excellence in school. Now school administration can focus on school growth by using our school management software. We have the best School Management Software and System in India. School Management System Software is used for managig school students fees records. Best school management software comes with best features. Now managing school is very easy as you get all the information on a single click. We are also providing free demonstration of the software. 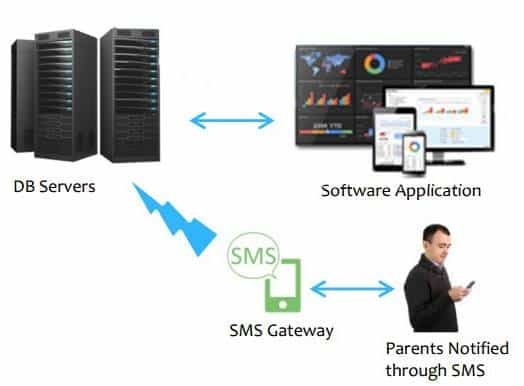 SMS integration, Fees integration, accouting of school and much more all you get in one software. You can call us for school management software demo. 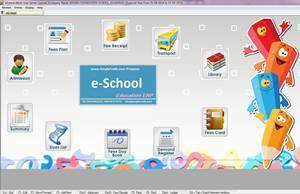 Click on the eschool link to download the software. Don’t wait call us now to get software for school management. Indian School Management Software is quite different from the one which is used in other parts of the world. We have tailor made software for the Indian school requirements. Download School Management Software by clicking on the following link. Manage multiple schools or organizations in one software. To get the School Management Software contact us by filling the following form. Or call us at 9818390836, 9315441053 you can also email us at info@ampletrails.com. Please share your requirements as well while filling the form. School software management can be define as all in one school management system i.e. design and develop to simplify administrative, academic and financial management of any school. School software is used by a large amount of education organization around the world to deal with all the school administration and management associated activities that comprise a student admission, student and employee’s attendance, examination, track record of student and employees performance etc in a specified and structured manner. We should get technology to make our life easy and efficient it in what we believe in. We also write an article about how to manage school easily with school software. The best thing about school management software is that it integrates all the department process and function of the school by consolidating respective information on a central serve which help in better information sharing and fast retrieval of information making the task more stream lined and organized. Thus in torn, help school management to take prompt decision. Various reputed school in India are using best school software management system to meet their administrative and academic requirement. SMS alert system for fees, exam, transport, management etc. Support for external device Interface like Bar Codes etc. Fill the following form to get in touch with one of our sales representative. Get the best School ERP Software in India. Specially designed for the schools in India. We have school software for school accounting software for school management. School automation software for automation of school accounting. 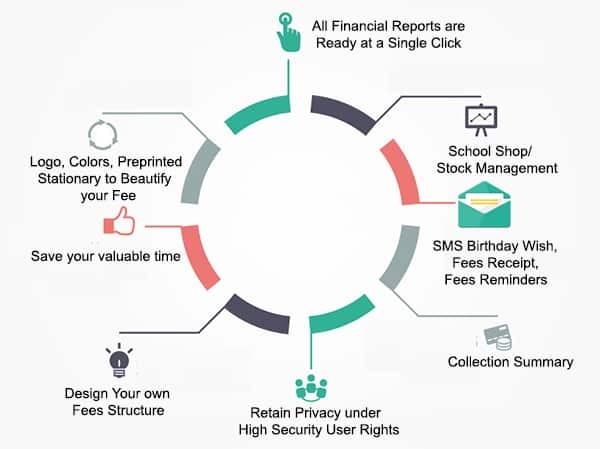 Get the school fee collection software free demo. Computerized fee collection software. School software can be used for fee collection from primary and secondary schools. School software can be used for management of students admission. Download free school software brochure from the below link. Get the school software in Gurgaon. We have our local partner in Bangladesh selling and providing services in Bangladesh. You can contact us for getting school software in Bangladesh. School Software Delhi is designed for schools in Delhi. Delhi schools have different requirements. Fee is collected by cash as well as through check. Some of the schools doesn’t collect fee directly. It’s done by the bank for them. Fee structure information is convayed to the banks. But still school need to maintain information for their records. Our school software provide all the facilities to maintain fee records. e-school management software is specially designed for school accounting management. School Software Business for Sales professionals. Want to sell school software to your clients? You can contact us for the same. We do re-branding of school software under your firms name. We have built the India’s most easy to use school software. Learning and implemention is school software is very easy. We provide complete school software documentation. Become school software reseller. To get the price of this school software do contact us by filling the following form. Or call us at 9818390836, 9315441053 you can also email us at info@ampletrails.com.